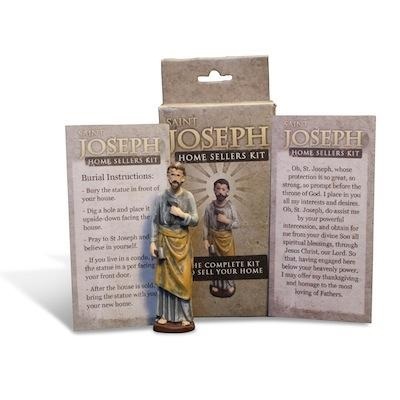 Click Here to receive a free St Joseph Gift from our team! Historians think that around 1500 A.D., European nuns living at a cloister needed more land on which to plant vegetable gardens and raise livestock. They had medals made that were imprinted with Saint Joseph’s image and wondered if burying them in the ground would help their prayers be heard and answered more quickly. Evidently, it worked because they nuns gained more land after burying their medals and were able to remain self-sufficient at their cloister. However, why the medals were ultimately forsaken for statues of Joseph is unclear. By engaging in this ritual, the nuns essentially reinforced the concept of turning something over to the will of God. Catholics and anyone else who believes that having faith can cause good things to happen believe that it is not the act of burying a medal or statue that precipitates the sale of house but that it is faith in the Lord and his saints which propels the materialization of desired property transactions. Modern St. Joseph Statues Available online in varying sizes (typically four inches or eight inches high), St Joseph statues are made of sturdy plastic, resin or pewter material and come in packages that provide a burial sack, prayer cards and instructions about how to bury the statue to sell a house. Catholic supply stores also carry St. Joseph statues meant for house-selling. Some statues feature Joseph standing alone while others have him holding the baby Jesus. • Always bury the statue upside down. The theory behind this request claims that Joseph will work harder to leave the ground when buried upside down so he can find a comfortable home in which to dwell. • Some say that burying the statue sideways so that Joseph’s praying hands are pointing directly at your house helps direct potential buyers to your home. • Bury a St Joseph statue in the backyard of your home near a flowerbed, shrub or other natural growth to expedite selling your home. • You can also choose to bury St. Joseph one feet underground (again, to make Joseph work harder to leave the ground and quickly find a nice home) next to your For Sale sign, even if it is in the front yard. • Once your house is sold, dig up the St Joseph statue and give it a place of honor in your new home. Day 2: O God, you love your people and bless the ordinary lives we quietly live. As you blessed St. Joseph, bless what I do, however hidden and simple it may be, and let all I do be done with love. Will St. Joseph Sell Your Home? Well, that’s up to whether you sell your home! For example, let’s say you do bury a St Joseph statue in your backyard by a beautiful rose bush, place a For Sale sign right next to the statue and the bush and say the prayers dutifully each day. Now, let’s say that a buyer approaches you within two months of burying St. Joseph and decides to purchase your home. It worked! But wait a minute. What if you perform the prayer correctly, wait for a buyer…and end up waiting two years before someone purchases your home. Does that mean it didn't work? That depends on how you perceive Gods Will for each of us.